Travel theme: Secret Places | Where's my backpack? I have a secret I’ve been bursting to tell you about since I first found out about it, but I held on for three entire days so that I could share it with you today for the travel theme, in the hopes that you might share one of your secret places too. A very dear friend of mine, Dan, was in town this week with a show. Dan is an extremely talented actor and musician, and a gifted teacher. I know this for a fact because we first met doing a show where Dan was music director, and he not only managed to teach me a series of challenging songs, but also magically got me to understand syncopated rhythm and taught me how to play a number of percussion instruments from around the world. Suffice it to say, in all things acoustic, I would follow Dan to the end of the world. In this instance, however, I only had to follow him to Times Square. After a wonderful evening catching up on life since we last met, we were walking towards Times Squares when Dan’s eyes lit up and he said he wanted to find the sound installation in Times Square. I was perplexed. I have walked through Times Square countless times and never noticed a sound installation, but I figured if there was such a thing, Dan would find it. I wandered through the neon-lit square which was completely deserted in the wee small hours, looking high and low for some mysterious exhibit to no avail, but when I turned, I saw Dan had stopped on the sidewalk with a great smile on his face. “Listen,” he said quietly, and as I stood on the metal grating in the sidewalk, I was enveloped in a rich, harmonic sound that seemed to rise from the grating and hover somewhere just above my head. It is hard to describe; a resonance with the essence of bells or gongs after they have been struck, or a church organ; a vibration of tones, a texture almost. It moved with me, as I travelled the length of the grating, shifting in volume and tone. 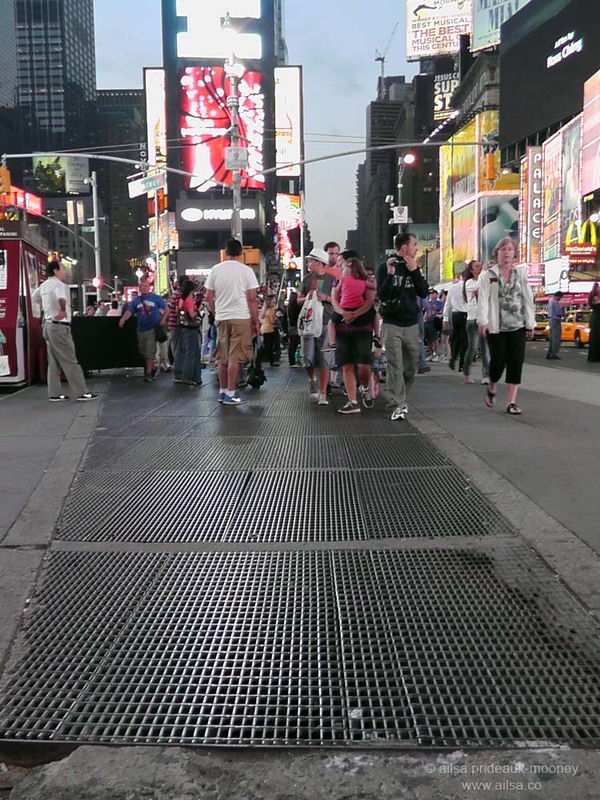 The artwork, appropriately called ‘Times Square’, is the work of artist Max Neuhaus, and is a skillful amplification of resonances already present underground, caused by the intersecting of several subway tunnels under the spot where the grating lays. There is no plaque marking the installation; it is something I guess Max Neuhaus intended for people to find in their own way. It is a secret hiding in plain sight. Here’s the best thing about the discovery. 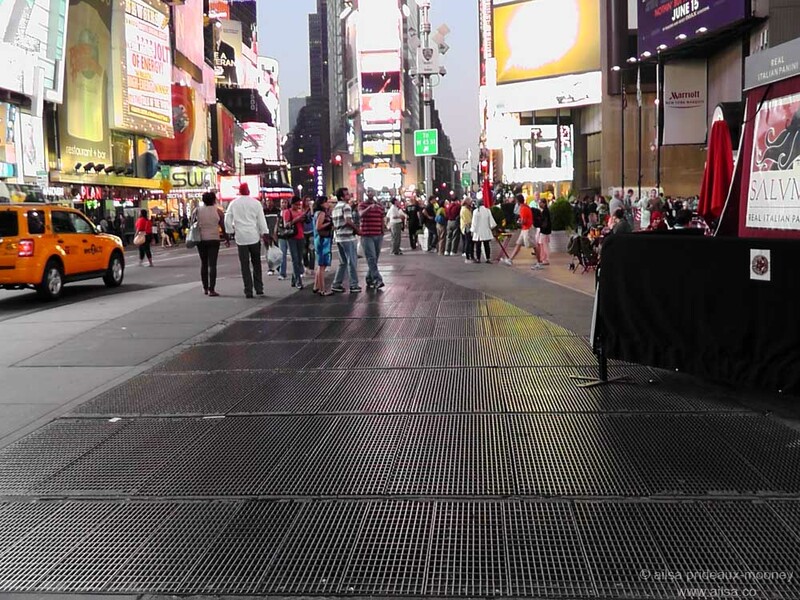 In the days since I first stood on the grating, I have passed through Times Square’s hustle and bustle in the middle of the day and made a point to walk over the grating. Each time I do so, the wall of sound drowns out the surrounding clamour and time seems to slow down just a little. It’s like a secret peaceful island in the middle of a sea of chaos, and it makes me smile. If you’re passing through Times Square, look for the installation in the triangular pedestrian island between 45th and 46th street, and smile a secret smile when you find it. If you have a secret place you’d like to share, create your own post between now and next Friday, title it “Travel theme: Secret Places” and put a link to this page in your blog post to make it easy for others to find your post. Where’s your secret place? This entry was posted in New York, Photography, Travel, United States, Weekly Travel Themes and tagged new york, photography, photos, pictures, postaday, travel, writing. Bookmark the permalink. A great story, well told! If I ever visit New York, I’ll make sure not to miss this installation. It’s brilliant, isn’t it, Emma, and exciting, like you’re in the select circle who are in the know, when you think about the thousands of people who rush by daily, oblivious to it. I actually sat by for a while, had a bet with a friend if we will see someone who knows it, after about an hour a girl came, about 12 years old, and just stood there for 2 minuets in total peace..
It’s true, Vlad, New York constantly surprises me. This was an amazing story, Ailsa. Your writing is thoroughly enjoyable. I’ve managed to come up with a secret place which you might be able to visit one day in France… I think there should be a pingback from it. Great post! It’s amazing what can hide in plain sight… I hope some day to get to New York, and I will, on that day, find this secret place… Thanks! Oh wow! Wish I had known about this last time I was in Time Square. I know that I was standing near that grating because I made a joke about acting like a tourist, took out my camera and snapped a few pictures of the neon signs. Generally speaking, I avoid Time Square, find it the most annoying of places, and from experience, know that must be one of the worst places in the world to be when you have a migraine. Now I have a reason to actually go there next time I’m in NYC. I am thinking about the secret place challenge. Have so many ideas. What fun! I think we’ll ALL look for it next time we’re there!! Now you have me longing to visit NY again, just so that I can also listen to this secret sound installation. I must ask my son if he’s experienced it yet. 😉 Thanks for the new theme. I’ll put on my thinking cap. You always have a very bright idea 😀 My participation to the theme this time http://campanulladellaanna.wordpress.com/2012/06/15/travel-theme-secret-places/ I have a special “Secret places” Nice to sharing. My regards to you. Alisa – this was hard! Pingback: Travel Challenge; Secret places « So where's the snow? Not so much a secret but a bit less obvious. So true, phil, I’m sure on a subconscious level that installation affects anyone who passes over it, even if they’re unaware at the time. Spectacular, Miguel, I want to go there right now! I think the fact that it’s practically inaccessible makes it even more wonderful. I also find cemeteries intriguing places to visit. When I lived in Japan I was fascinated with the very different approach they have to cemeteries there, visiting them frequently on family outings to honour their ancestors. Really lovely. WOW! I’m going to be in Times Square tomorrow. Thanks for the heads up. Hope you find the installation, Cindy. Lovely post, I am particularly intrigued by the Escopus Lighthouse, I wonder if you can visit it. Yes, I found the installation, stood on it for a while and listened. When you look down, it’s as if you are looking into the innards of Manhattan. Amazing. The sound emanating was calming. Thank you. I’ll do some investigation into the Escopus Lighthouse. You most definitely can visit it. Ooh reb, that installation in Sweden sounds wonderful! Hello Travel Themers!!! I’m a little late to the party this week, but here’s one of my secret places. Perfect, CTB, everyone needs that secret place to take some time out. While I’ve been in New York, my place to escape the craziness of big city life has been the rooftop of my building. Nobody goes up there, so it’s the perfect place to just sit and watch the world go by. Yes that would be perfect… sometimes you need that alone time. I like to sit on my balcony here and have coffee when it is still early and people are just getting up. So peaceful. Awesome entry, Tahira, a secret place in the middle of the desert, so fabulous. That’s pretty cool that we are in the know now about NY. I love learning stuff like that. This was a tough theme. I posted about a place I felt was hidden from me since I didn’t ever hear about it. Thanks for the inspiration. Beautiful secret garden, I shall try to visit it when I visit Boston. Really lovely, reb, it almost looks like a secret island. Ooh, a grown up secret hideaway, love it!